Adf.ly is an ad publisher website. It helps to promote your business online for spending a little money and also you can make a cool income from your website/blogs/twitter or other social Medias for just sharing shirked URLs. And its full site script may convert your sites visitors in to real money. 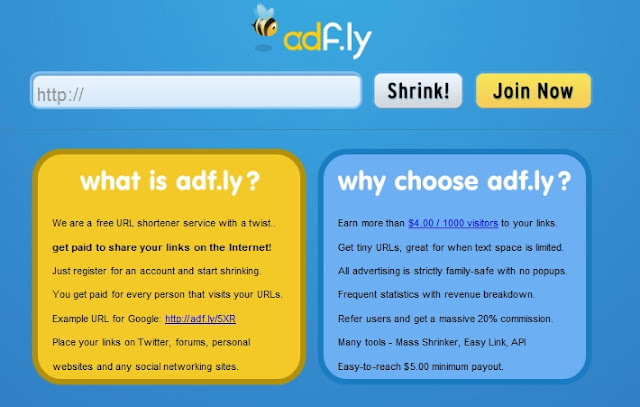 Ad fly is a free online URL shortening tool. To make money simply share the shortened link on internet when any users click on your link you get money. If huge number of users clicks on your shortened link you get huge money. Ad Fly is a free URL shortening online tool used to convert long URL to short URL. It also has a money making program, when you can join on this program you can get paid real money for sharing shortened link over internet. When any users click on the shortened link they switch to a 5sec sponsors ad and then redirect to the original URL. You get paid for sending your user to the sponsor site for just 5sec. Sponsors (Advertisers) Pay money to Ad Fly for distribute ads >> Ad Fly pay money to members who sending visitors to sponsored websites for just 5sec. Just register for a free account. Shares shorten URL's on internet. You can place your links on twitter, online forums, personal websites and many social website. Each person clicks this links you get money. You can earn more than 4.00 Dollars per 1000 visitors to these links. And also boost your income by referring your friends to adf.ly. Get massive 20% commission per users you referred to adf.ly. Payments made via PayPal and Payza. Minimum cash out is 5 Dollars.